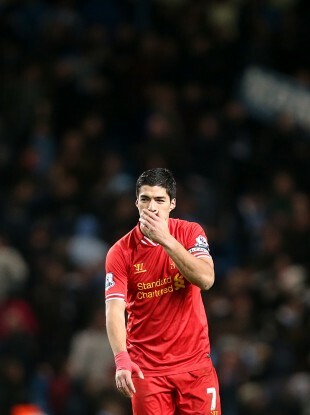 Liverpool's Luis Suarez shows his dejection after the final whistle against City. GODFREY’S BEEN A very bad canine recently, I’m afraid. Maybe I had a little too much sherry with my Christmas pudding, as last week, I committed the cardinal-but-common sin of forgetting to update my fantasy team. It would be okay though, I thought, I had Luis Suarez as my captain — he always scores. However, shockingly, Suarez had the temerity to let me down. And to think, after all that energy I expended shouting at the TV, he didn’t even have the decency to create a mere assist. Some people just have no manners whatsoever — he wouldn’t even persuade Vincent Kompany to score a Renford Rejects-esque comedy own goal for old time’s sake. But I shouldn’t be surprised, I suppose. As some lad on Twitter pointed out, he never does it in the big games, does he? Yup, apart from those times he scored against United, City, Arsenal, Chelsea and at the World Cup, he’s been rubbish. And let’s face it, you or I could score goals for fun when backed by a midfield with the talented likes of Lucas and Jordan Henderson about. He even got to play with Zinedine Zida… I mean, Stewart Downing, for a full two years. So mark my words, there’s a greater chance of Sir Alex Ferguson coming out of retirement to manage Timbuktu than there is of Suarez finding the net against a top, top side. Anyway, in other news, I’m not sure how — again, it must have been the effects of the pre-Christmas wine, circa September — but Peter Whittingham was still in my team until today. While the novelty was fun while it lasted, the Christmas run-in will undoubtedly be vital for my (fantasy) title hopes, so it’s essential that the team is treated seriously. Probably because he spent last season struggling to get into the Leeds team, Ross ‘the new Pele-Maradona-and-Best-all-rolled-into-one’ Barkley is just 0.1 more expensive than Whittingham. So buy him and make him captain if you want — after all, Luis Suarez is playing against a big team again this weekend, and therefore, he’s obviously not going to score. Some lad on Twitter told me so. Email “Diary of a Fantasy Gaffer: Christmas pudding and wine do not a good fantasy player make”. Feedback on “Diary of a Fantasy Gaffer: Christmas pudding and wine do not a good fantasy player make”.